Dirofilariasis is a rare zoonotic parasitic infection caused by helminthic nematode belonging to the genus Dirofilarae. A habitual parasite of canines, dirofilarial worms rarely can cause accidental infections in human beings. In man, dirofilarial infections usually present as pulmonary, peritoneal, ocular or subcutaneous lesions. Among the 40 species recognized, fewer than six are known to cause human infections. Of these species Dirofilaria repens, Dirofilaria ursi, Dirofilaria tenuis and Dirofilaria striata are found in the subcutaneous tissues while Dirofilaria immitis and Dirofilaria spectrum are found in the heart and blood vessels of man. The species responsible for subcutaneous dirofilariasis varies with geographical area, most of infections in Asia being caused by the filarial worm, D. repens. Human infections caused by D. repens have been reported throughout Asia, Europe, and Africa. Dirofilariasis has not been widely recognized in India, but a few case reports from Kerala, , a southern state of India, suggest a possible focus of infections with D. repens in this region. It is a vector borne disease and transmission to man occurs through the bite of potential mosquito vectors. Exposed part of the body including the head and neck region and the lower extremities form the common subcutaneous site of involvement with the majority of the cases occurring in the ocular and peri-ocular region. Oral dirofilariasis is extremely rare and only a few cases have been documented. The diagnosis usually is done by the microscopic study of the excised specimen and the specific identification of these filarae is based on their morphological features in tissue sections. 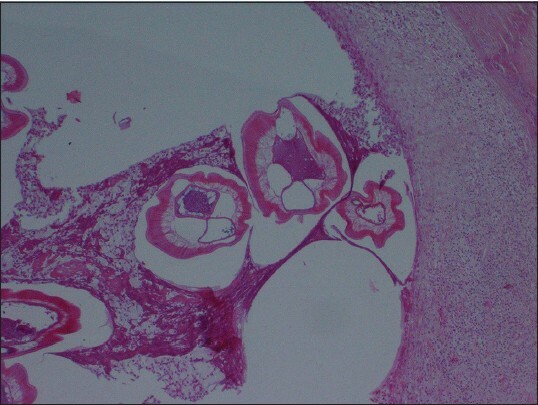 We report an interesting case of dirofilariasis of the face with the involvement of buccal mucosa, which was diagnosed based on the demonstration of dirofilarial worm in the tissue sections in a patient who presented with a recurrent facial swelling. A 54-year-old female patient presented with the complaint of a swelling of 11 months duration in the left side cheek. The swelling was intermittent in nature and the patient gave a history of multiple episodes of enlargement of the left side of the face. The development of the swelling was preceded by itching, especially in the night. 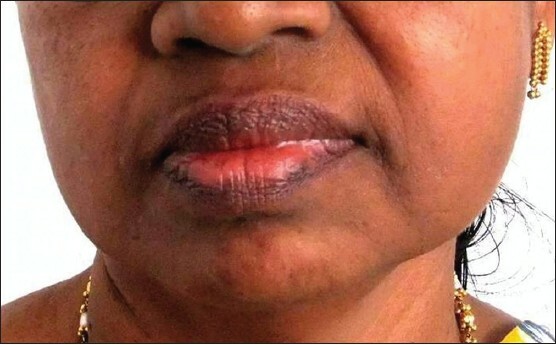 Extra-oral examination revealed a diffuse swelling in the left side of the face causing mild facial asymmetry [Figure 1]. The swelling was firm in consistency and the overlying skin appeared to be normal. Intra orally, an oval shaped swelling measuring 1 × 0.5 cm, was noticed in the buccal mucosa in relation to 26, 27 [Figure 2]. The lesion was firm in consistency, mobile and slightly tender. Ultra sound guided (USG) fine-needle aspiration cytology was carried out. USG showed a small well defined hypo echoic lesion in the muscular layer of left cheek region measuring 0.8 × 0.5 cm with small specks of calcification. The cytology was nonconclusive as only red blood cells were seen in the smear. Peripheral smear did not show any abnormality. Complete blood count and erythrocyte sedimentation rate were within normal limits. Based on the clinical presentation of a recurrent facial swelling of long duration with ultrasonograph showing hypoechoic lesion associated with specks of calcification, various calcified soft tissue lesions common in the facial region were considered for differential diagnosis. Calcification within a lymph node usually follows a chronic infection involving a lymph node. Tuberculosis being common in India, calcified lymph node was thought be the most probable diagnosis. Other lesions considered include sialolithiasis, pleboliths and traumatic myositis ossificans. The lesion was excised through intraoral approach and the tissue was submitted for microscopic study. 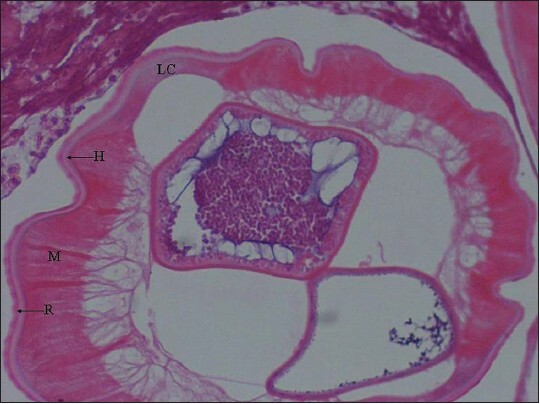 Histopathological examination of the tissue sections showed multiple transverse sections of adult filarial worm [Figure 3] with outer multilayered cuticle showing external ridges, hypodermis, lateral chords (LC) and a well-developed inner muscular layer lining a pseudocoele cavity. Within the cavity, intestine and male genital tubule containing spermatocytes were seen [Figure 4]. 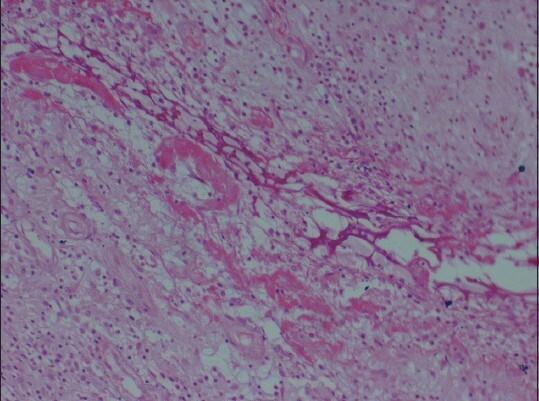 The lesion was well-circumscribed and the surrounding connective tissue showed granulomatous reaction with dense inflammatory infiltrate consisting of lymphocytes, neutrophils, eosinophils, and epithelioid macrophages [Figure 5]. The morphological features of the filarial worm were consistent with adult male dirofilaria and the lesion was diagnosed as oral dirofilariasis. Further examination was carried out for identification of the species. The cross sections of the worm showed prominent external cuticular ridges, each separated from the next by a distance greater than the width of a ridge and well-developed, tall musculatures [Figure 6] which are characteristic of D. repens. Based on these features and the epidemiological evidences, the filarial worm was identified as Dirofilariasis repens. Later, the images were sent to DPDX, a website developed and maintained by Centers for Disease Control Division of Parasitic Diseases and Malaria and the diagnosis was confirmed. Review of the patient after 2 weeks showed complete resolution of the lesion and the healing was uneventful. The filarial worm belonging to the genus Dirofilarae are natural parasites of canines. Most of them live in the subcutaneous tissues of their hosts and produce microfilariae which circulate in the blood and in most instances are transmitted by mosquitoes of genera Ades, Anopheles or Culex. Development in the mosquito requires about 2 weeks and these parasites require several months to reach sexual maturity in their natural definitive hosts. Dirofilariasis is accidentally transmitted to man through the bite of mosquito carrying infective larva. In the human body, if the parasite is not rapidly destroyed by defensive reactions of the host, it grows gradually and can reach adulthood within a span of about 6 months. Further development cannot take place in human tissue and subsequently the parasite dies before producing microfilaria. Dirofilaria repens is a common subcutaneous parasite of dogs. In man, infection by D. repens usually present as a subcutaneous nodule on upper half of the body with largest number of cases localized around eyes, eyelids and conjunctiva. Intra-oral involvement is extremely rare. The limited number of cases documented, showed a predilection for buccal mucosa , followed by lips. , Our patient presented with a diffuse, nonspecific facial swelling with intra oral manifestation. The facial swelling had a periodic nature and was associated with pruritis. In this case, due to rarity of the lesion, dirofilariasis was not considered a diagnostic possibility, clinically. The specks of calcification within the hypo echoic lesion seen in USG, which was interpreted as a calcification within a soft tissue lesion turned out to be the subcutaneous inflammatory nodule harboring the dirofilarial worm on microscopic examination. Demonstration of the adult dirofilarial worm in the tissue sections remain the gold standard of diagnosis of dirofilariasis. A thick laminated cuticle with external longitudinal ridges and the presence of a well-developed circumferential musculature interrupted by two lateral cords are characteristic features of Dirofilaria. , The differentiation among the species is done based on the size and the features of the body wall, that is, thickness of the cuticle and its structure, ridges, LC, number and type of muscle cells. The key features useful in the identification of D. repens are longitudinal ridges separated by a distance wider than the ridge itself, 95-105 ridges on the circumference of the body and 2-5 chord nuclei in each cross section of worm. However, species identification is not always possible as the dirofilaria infections elicit strong inflammatory response in the human tissue, which often leads to regressive alterations affecting the morphological features. Identification of the parasites in such situations should be closely correlated with its geographic distribution and the area where the infection was acquired. 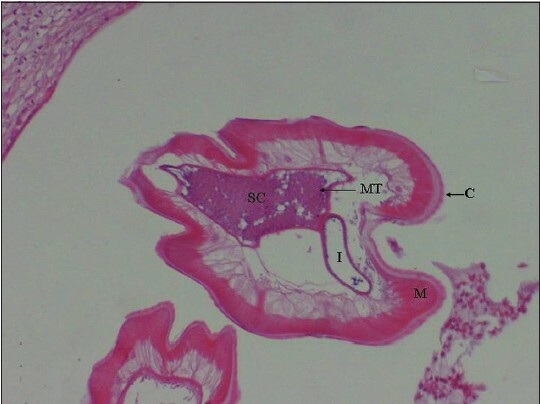 In this case, even if the granulomatous tissue reaction was noticed in the surrounding connective tissue, the morphology of the worm was well-preserved, which made their identification possible. Human dirofilariasis is usually regarded as infection by a single worm. Hence, excisional biopsy is curative and no further treatment is required. Dirofilariasis is an emerging zoonosis and should be included in the differential diagnosis of an asymptomatic facial swelling. It is equally important for the pathologists to be familiar with the diagnostic characteristics of the nematode to avoid misdiagnosis. 1. Boreham RE, Cooney PT, Stewart PA. Dirofilariasis with conjunctival inflammation. Med J Aust 1997;167:51. 2. Bruijning CF. Human dirofilariasis. A report of the first case of ocular dirofilariasis in the Netherlands and a review of the literature. Trop Geogr Med 1981;33:295-305. 3. Singh R, Shwetha JV, Samantaray JC, Bando G. Dirofilariasis: A rare case report. Indian J Med Microbiol 2010;28:75-7. 4. Padmaja P, Kanagalakshmi, Samuel R, Kuruvilla PJ, Mathai E. Subcutaneous dirofilariasis in southern India: A case report. Ann Trop Med Parasitol 2005;99:437-40. 5. Sabu L, Devada K, Subramanian H. Dirofilariosis in dogs and humans in Kerala. Indian J Med Res 2005;121:691-3. 6. Logar J, Novsak V, Rakovec S, Stanisa O. Subcutaneous infection caused by Dirofilaria repens imported to Slovenia. J Infect 2001;42:72-4. 7. Orihel TC. Dirofilaria corynodes (Von Linstow, 1899): Morphology and life history. J Parasitol 1969;55:94-103. 8. Pampiglione S, Rivasi F, Canestri-Trotti G. Pitfalls and difficulties in histological diagnosis of human dirofilariasis due to Dirofilaria (Nochtiella) repens. Diagn Microbiol Infect Dis 1999;34:57-64. 9. Pampiglione S, Canestri Trotti G, Rivasi F. Human dirofilariasis due to Dirofilaria (Nochtiella) repens: A review of world literature. Parassitologia 1995;37:149-93. 10. To EW, Tsang WM, Chan KF. 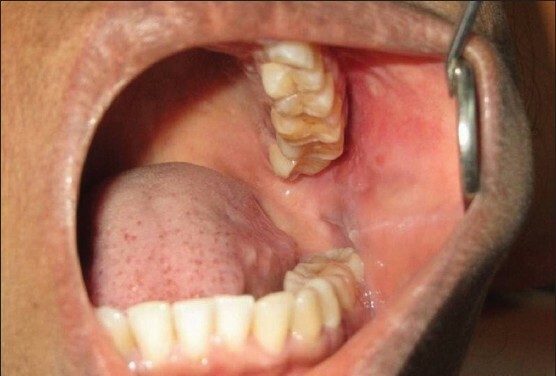 Human dirofilariasis of the buccal mucosa: a case report. Int J Oral Maxillofac Surg 2003;32:104-6. 11. Tilakaratne WM, Pitakotuwage TN. Intra-oral Dirofilaria repens infection: report of seven cases. J Oral Pathol Med 2003;32:502-5. 12. Ratnatunga N, Wijesundera MS. Histopathological diagnosis of subcutaneous Dirofilaria repens infection in humans. Southeast Asian J Trop Med Public Health 1999;30:375-8. 13. Orihel TC, Eberhard ML. Zoonotic filariasis. Clin Microbiol Rev 1998;11:366-81. 14. Gutierrez Y. Diagnostic Pathology of Parasitic Infections with Clinical Correlations. Philadelphia, Pa: Lea and Febiger: 1990. p. 316-35.